Well what do you know, it’s neither Guild Ball pitch ideas or things for D&D, it’s an Infinity after-action report! Note: apologies the images of the game are a bit washed out, I always forget to shut the blind to cut the sunlight down. I rolled up Antenna Field for the mission and we set the points value at 300 for a regular game. 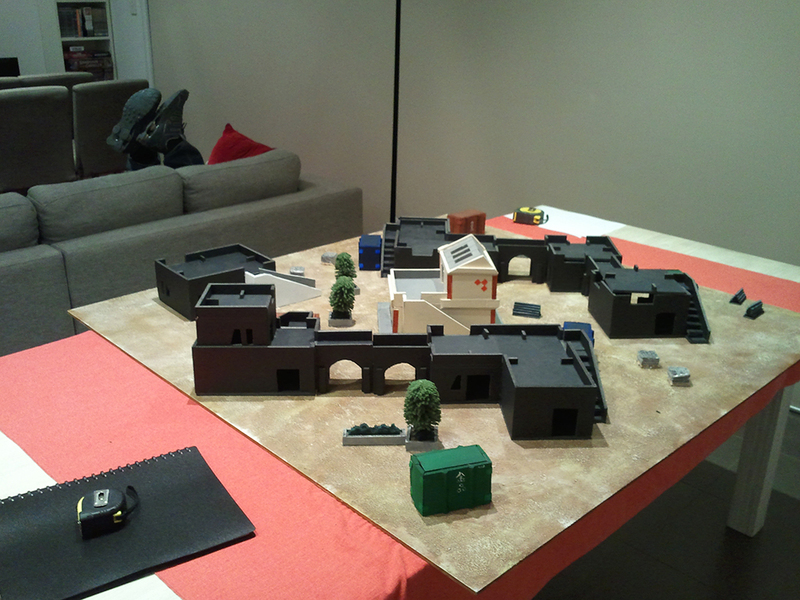 The table set up I did gave some pretty sweet firing lanes, but some good positives and negatives to both sides. 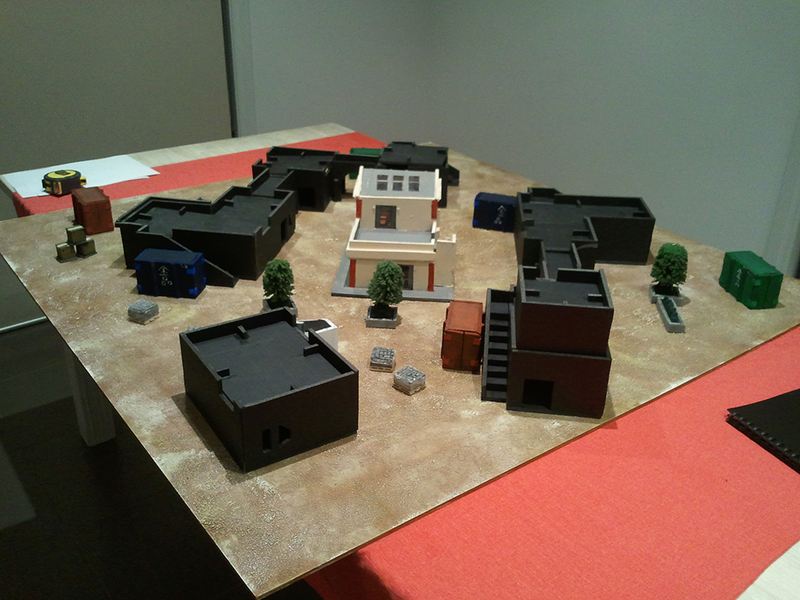 One of the two story buildings in particular had sight over four of the objectives (represented by my weapon cates). The two classified objectives I drew were both hacking ones – Data Scan and HVT: Espionage – which made me pretty glad I made a last minute tweak to my strike team! Isobel was the late inclusion. I don’t usually take her because frankly just taking a Wardriver is a better deal. But I had the points and didn’t really have anything to spend the extra points a Wardriver would free up on. I also wanted to use some things that my mate, Matty, hadn’t seen before. That led to the inclusion of the Assault Pack and the Cataren (who I try to work in to every list any way after in his second mission he netted over 200pts in kills). Tactics for this list are pretty standard: flamethrowers (hopefully) infiltrate in; Chasseurs and FTRs infiltrate as far up as possible, get to the objectives ASAP and unload their mines; heavy hitters (Spesnatz, Tankhunter and Cataren) pick things off and hold the line; Volunteers guard the deployment. I won the WIP off and took first turn. If you’ve read any of my Operation Flamestrike reports you’ll know this is pretty standard for me. If I don’t win it, my opponent usually gives it to me. So I’m used to having to make my moves first and clear out nasty sniper and HMG nests. 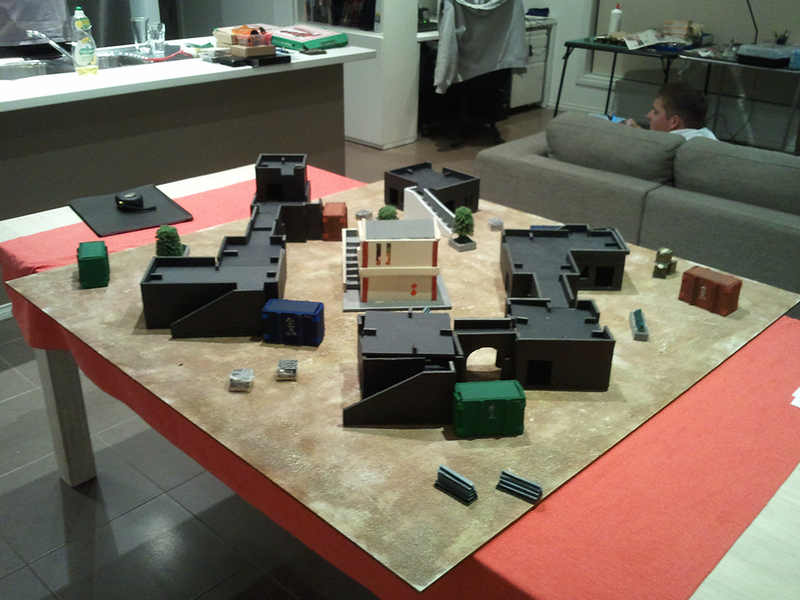 Matty surprised me and took the deployment without the two storey buildings. They were brilliant sniper nests and I knew he had two (pre-game talk). My Grunts failed their infiltration rolls, which was pretty bad, but these things happen and you shouldn’t plan a game around having models in your opponents half of the field. I settled with putting one a piece on my far left and right flanks. Then, from left to right, the Handler took the painted building; just in front the girder pile on the left flank one of the Chasseurs and FTRs infiltrated; the decoy and Tankhunter took the top of the left two story building, the Spetsnatz at the base; Isobel was on the ground floor of the middle two storey building, reading to dash out and hold my antenna; the second FTR infiltrated as far forward in the middle as possible; then behind the shipping container on the right were the Antipodes and cataren; in front of them was the second Chassuer and the Marauder. Finally, Voronin and a Caledonian were in the back centre and the last Caledonian was on the ground floor of the left two storey building. I can’t recall the precise Tohaa deployment, but the basics were as follows. The left flank had a TO camo marker right up next to the building my Chasseur was in (a Clipsos). The L shaped building on the left had a Triad including an engineer with a K1 rifle. In the centre of the field was a sapper with a viral sniper. Finally the building on the far right was loaded up with three Triads. Two Gao-Raels, one with a sniper the other with a spitfire and each in a different Triad were set up to cover the field from cover. Out of sight were a couple of Makauls, an engineer and some Kamaels. First order of the game saw a move move from the Antipodes with their irregular order. The Gao-Rael with the spitfire discovered the front one, so I decided to hold off pumping orders in them for now. If he had failed, I certainly would have. Instead, in response I moved my Cataren up. Climbing the two storey building on the right in the mid section of the field with climbing plus, the Gao-Rael sniper failed to discover him before he went prone. Creeping him up I lined up a shot on the spitfire alone. Queue two orders in which I failed to kill the spitfire and almost lost my own head for the trouble. With only a single order in Group 2 left, I decided to leave it for now and see what else I could achieve. A succession of orders to Group One saw both Chasseurs move up and hit prone without being discovered to plant themselves next to the antennae on the left and right of the field. Then came the mines, one on the left, two on the right. Isobel also moved up and prone next to the antenna on the edge of my deployment. 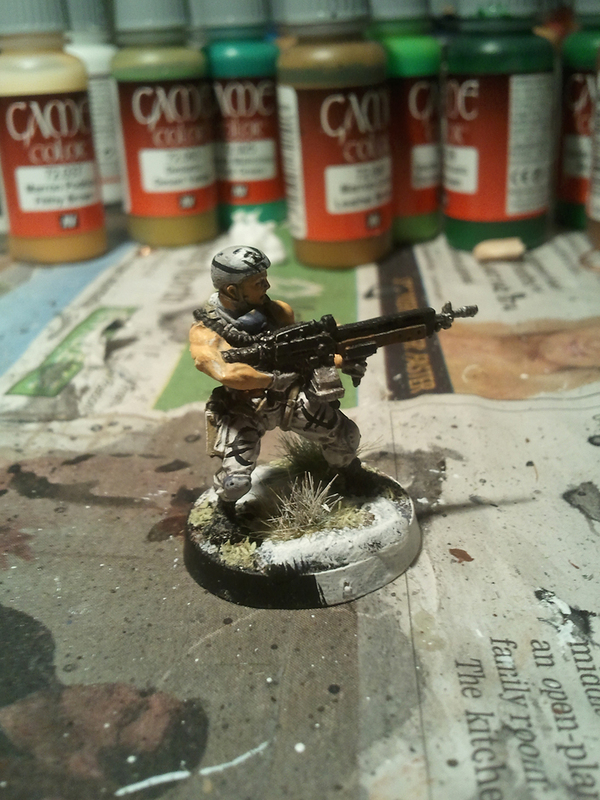 With the objectives secure, it was time to pump orders into my Spesnatz and shift him to deal with the Gao-Rael sniper. What we didn’t realise was a Kamael on the ground floor could also see him when he broke camo to take his shots. The sniper had chosen to discover, so I went with two free shots on him, the Kamael took the other two – also free shots because Matty failed to consider the -12 thanks to camo, surprise shot, cover and range. The result? A single hit on the sniper which was saved. At this point I had a single order in both combat groups left. I’d secured the objectives, but I was set to have a full and highly efficient Tohaa murder list coming at me. I put another order into the Spesnatz, two shots a piece again. The sniper shot back, the Kamael dodged. Both failed and not only did all my shots hit home, they took a crit a piece. Both then failed their armour saves, leaving the Kamael Very Dead and the sniper unconscious. The kicker was that both were leaders to their respective Triad – two deaths and two broken links. Not good for Tohaa! But it got worse. With my last order the Cataren was back up and going toe to toe with the spitfire. Both shots landed home and both saves were failed. 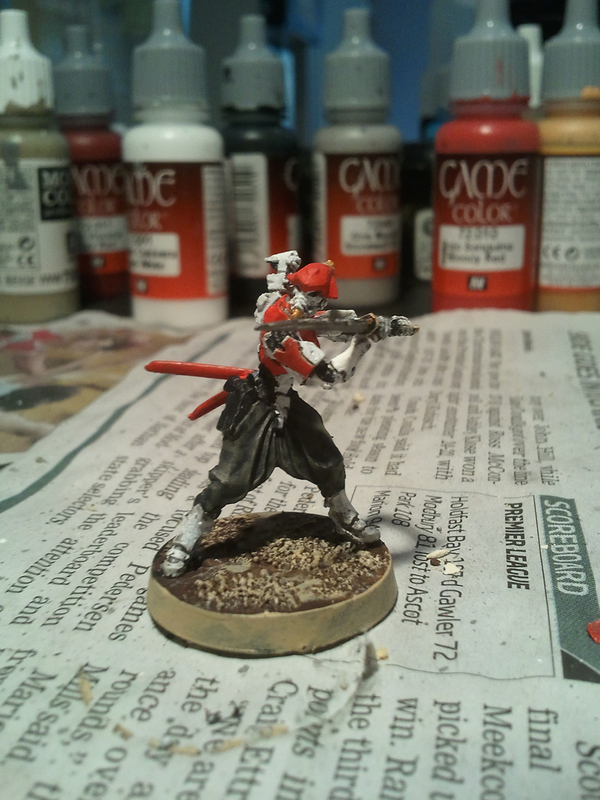 The last Gao-Rael was turned to red mist from a total for four wounds and the third triad on the right was broken. It was more or less all over red rover for Matty’s Tohaa at this point. The loss of the Kamael was no biggie, but the two Gao-Raels were a big chunk of his killing power. On top of that, I’d broken three triads. None the less, he persevered. He reformed a triad on the right with two Makauls and a bio-engineer. They then spent several orders throwing eclipse grenades for some and moving to creep up the field without my Cataren being able to do anything in response. They broke through the smoke out of my Cataren’s field of fire and unleashed a double shot heavy flamethrower on my Antipodes. The dogs nimbly dodged the flames and used kinemetika to move closer to the triad. The last order from the makaul triad saw them move into close combat with my Antipodes using assault to get in also. The result was a 2v3 melee which ended in a stalemate – a 16 and 20 saved one dog from the nasty viral close combat weapon. 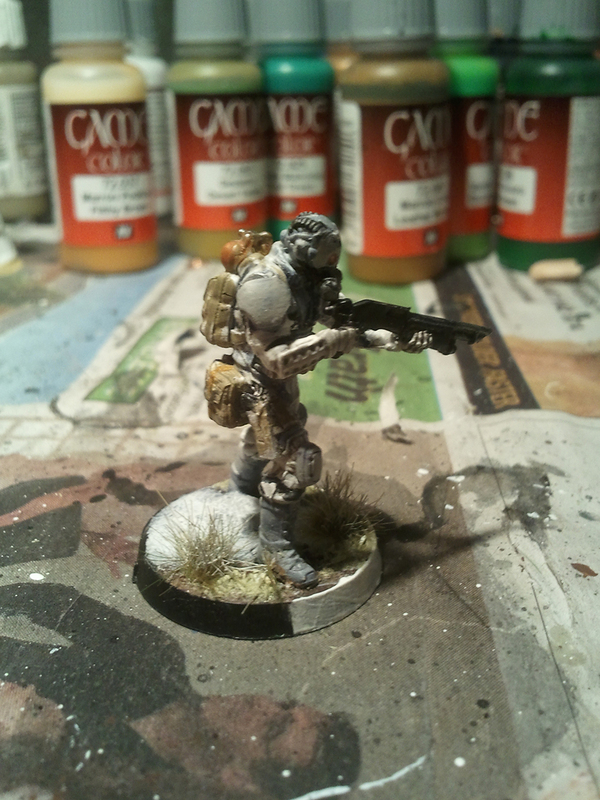 Over on the other flank, the triad with the K1 rifle moved up – also using eclipse grenades to cover their advance. Matty took a risk and broke through the smoke with a move move. I took the opportunity to pop my tankhunter, firing on the engineer. 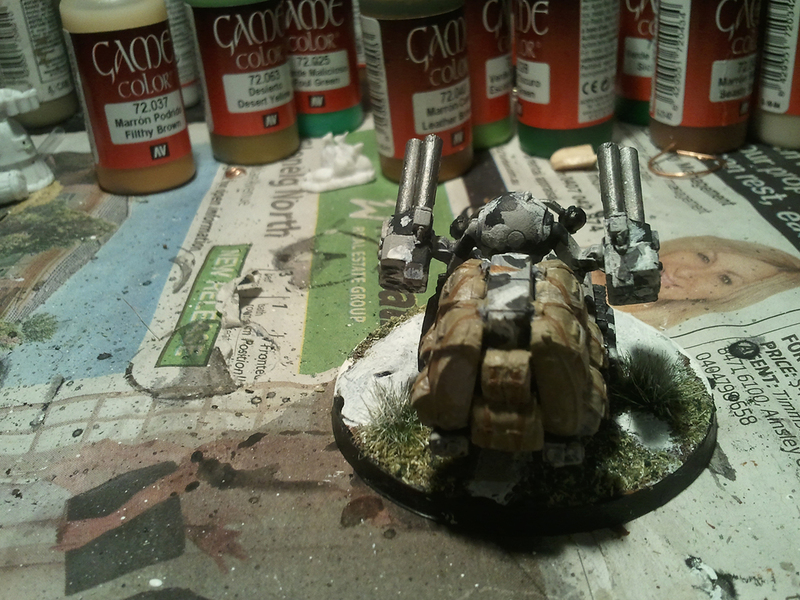 The K1 rifle was promptly blown apart by the autocannon, yet more pain for the Tohaa. At this point it was clear the game was all but over. Matty decided to leap his Makaul on the left into combat with my Chasseur – whom he easily dispatched, unfortunately my mine did the same to him. The sapper and the tankhunter had a shoot out, but again my luck came through with another 16 and 20 save against a viral sniper shot. We played out the melee in full over three orders, in each an Antipode died. You don’t get to see close combat in Infinity all that often and certainly not a brawl like we had going. It was certainly the highlight, even if the Makauls were head and shoulders above my dogs. With the Antipodes all dead, I moved my grunt on the right out from the building and took out the Makauls in two successive orders with my light shotgun. He even survived a heavy flamethrower for his trouble. 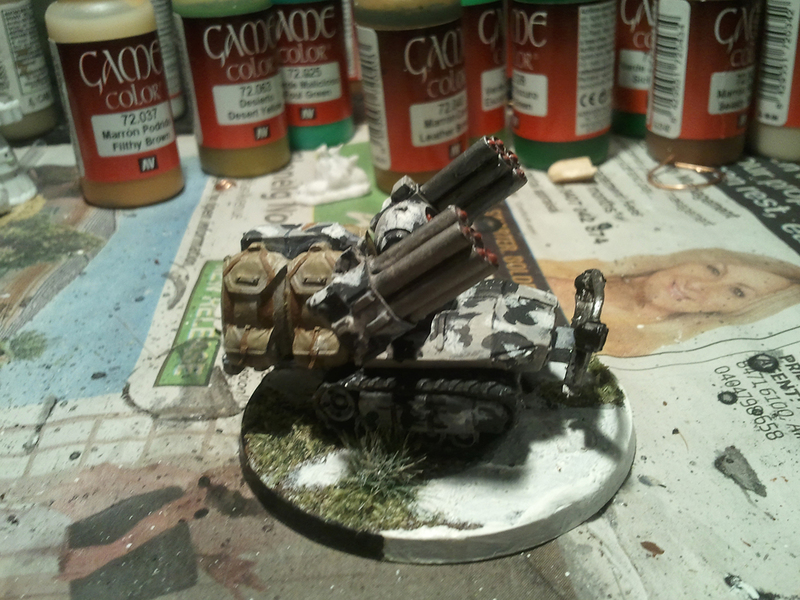 Finally the tankhunter blew the sapper into tiny little pieces with his autocannon. I still had plenty of orders left, but with the Tohaa left with a single Clipsos and a bunch of Kamaels in full retreat, there really wasn’t much point. We didn’t bother tallying the score, but it would have been something like 6-0. Neither of us had played since April-May, so we were a bit rusty. Matty took the side he did because of his sapper, which couldn’t get good lines of fire on the side of the board with the better sniper/HMG nests. The Kamael on the ground floor that the Spesnatz took out was very poorly positioned (he wasn’t in cover). Also has the models out in the open assigned as the link leader was a Very Bad Idea. For me, there wasn’t anything that I did that struck me as a poor move. Moving the grunt out before the combat had ended would have been smarter, but it wasn’t necessary. Everything operated as it should and my plan went off without a hitch, more or less. Personally I find Tohaa quite a formidable faction to come up against – especially given my preference for first turn. Tohaa are a very strong reactive turn faction. But if you can break their triads they really break down quickly. Hopefully Matty has better luck next time and we get a better game – our last match back in April was a real nailbiter that ended in a draw. 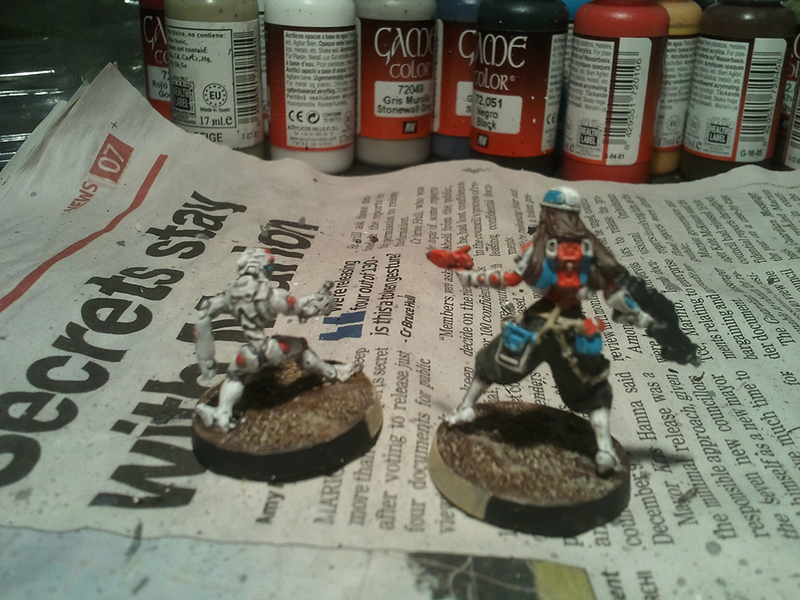 Progress on my Welshmen isn’t as good as I had hoped, but I’ve been busier than expected. They should be done before Christmas though, so I’ll be happy with that. I’ve draft a few posts on some different things, so I’ll pick one of those for next time. So as the title of this post makes clear, I would have posted this Friday, but I worked late. The yesterday I was capital B Busy. 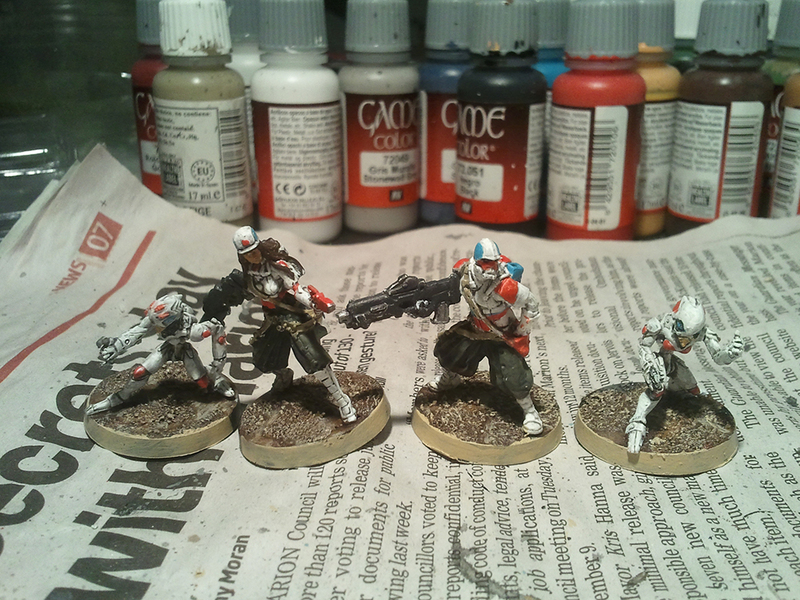 But today, today I can share the Infinity models I have painted since April. This post is pretty pictures heavy and I’m in a bit of a rush here because my sister and co should be around for D&D very shortly. Paracommando with HMG. 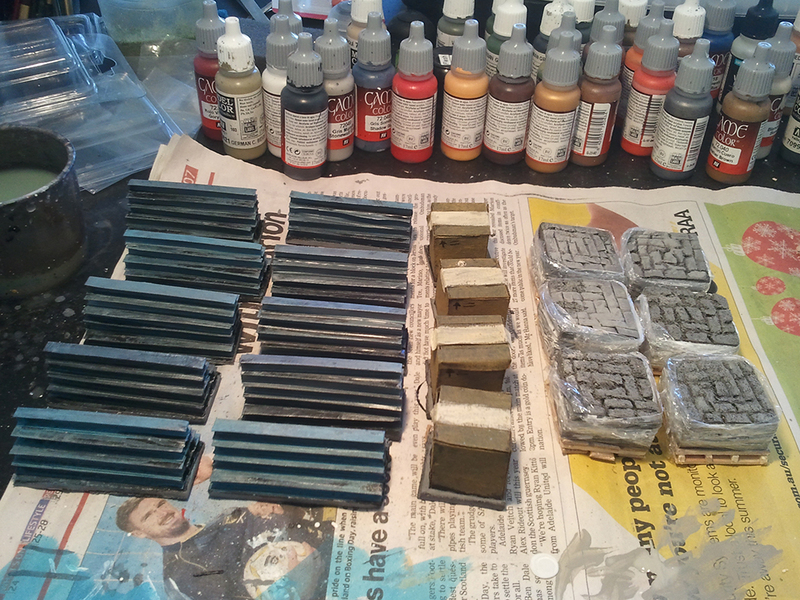 Standard colour scheme (Stonewall Grey base, German Grey “S” shapes, Dead White patches and black splinters. Packs/bags are in German Camo Beige. Guns are in black with Beige Brown wooden parts). 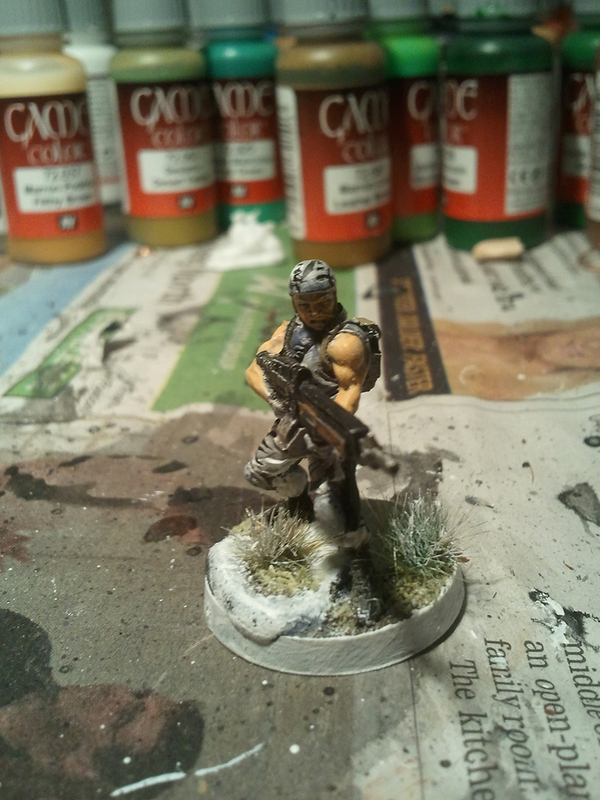 And Paracommando with rifle. She shot something once. I don’t think it died. It was a sad day. He has a boarding shotgun. He walks on from the side of the board and shoots things. That’s what he does. I’m used him a few times – not with any great success. Regular colour scheme, nothing special to report on here. Above we have the Katyusha (or what I am going to call the Katyusha, I don’t actually know which is which). 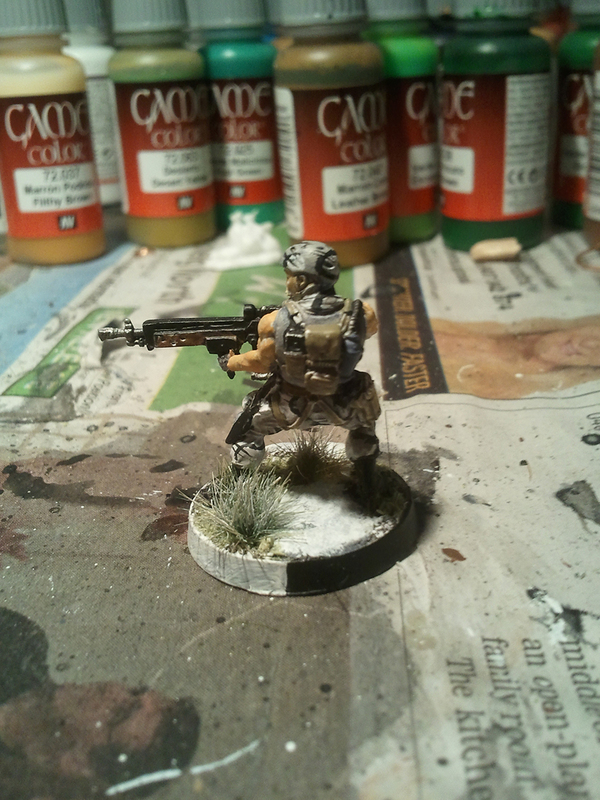 I originally tried the regular splinter camo pattern I do on my models. It didn’t work, however, so I went with splotches instead. The base is Stonewall Grey. On that I have large patches of German Grey, finishing with small patches of Dead White. The baggage at the back is just German Camo Beige with Brown Beige straps. 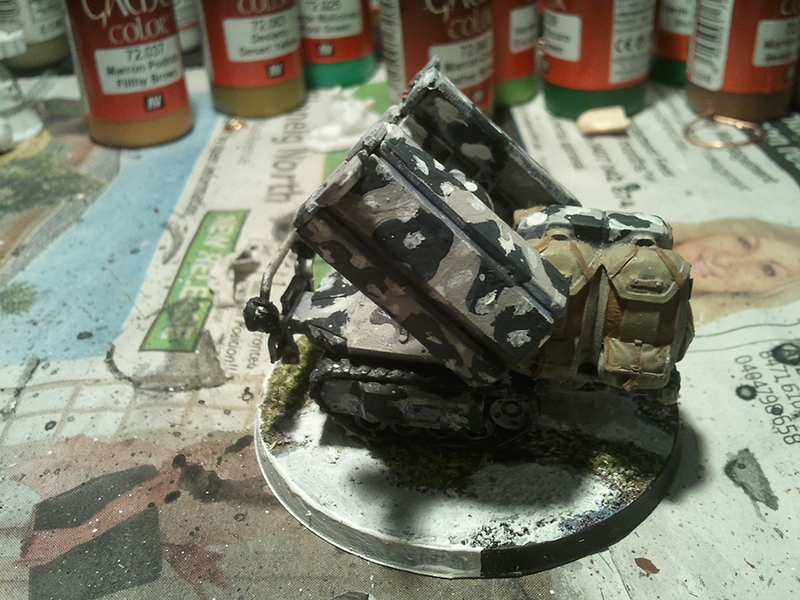 Tracks are German Camo Grey dryburshed with Gunmetal Grey. And then we also have the Uragen. 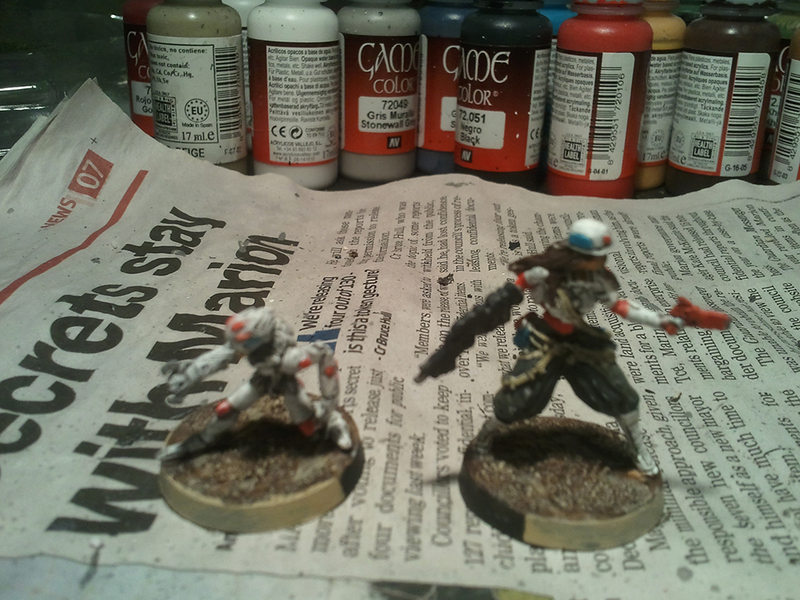 I have actually used both models prior to painting. I like them both, however I think the Uragen is probably more worth it. If you are playing Supremacy or any of the game modes where the Baggage special rule is in play, the Traktor MULs are a great pick. That +20 points per model they count for when determining area control will win you games. So it’s April already. Unfortunately I’ve been struggling with motivation to get things done at the moment, but Infinity March was a moderate success. I think the issue is I have enough Ariadna and JSA to field a 300pt force with plenty of choice, so it’s been slow going. Nothing out of the ordinary here. I got my last Haramaki done the other week, so now I have all the models done (they only have an availability of 2 though, so even though there are 5 models, you’re only ever fielding 5). 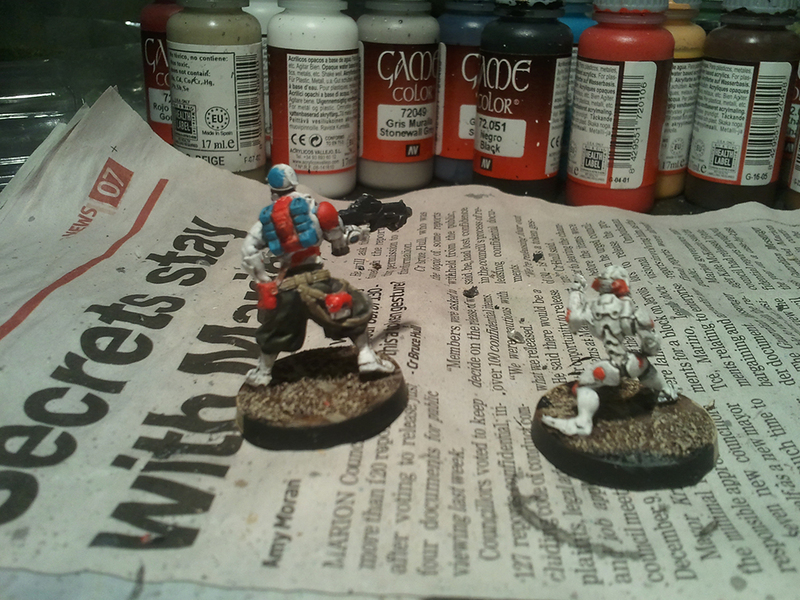 Blood Red, Dead White and German Field Grey over German Grey. Stock standard stuff. 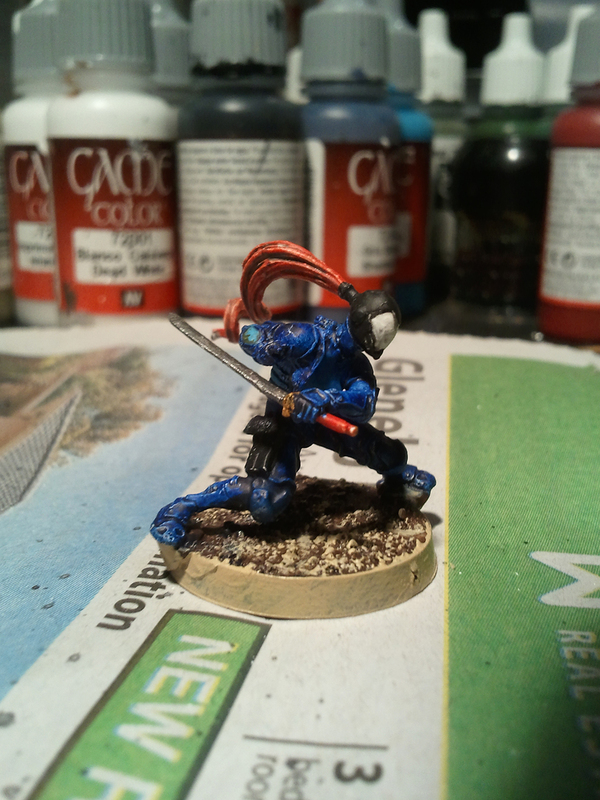 I also got my last Ninja finished off the other week. This is the hacking device model. 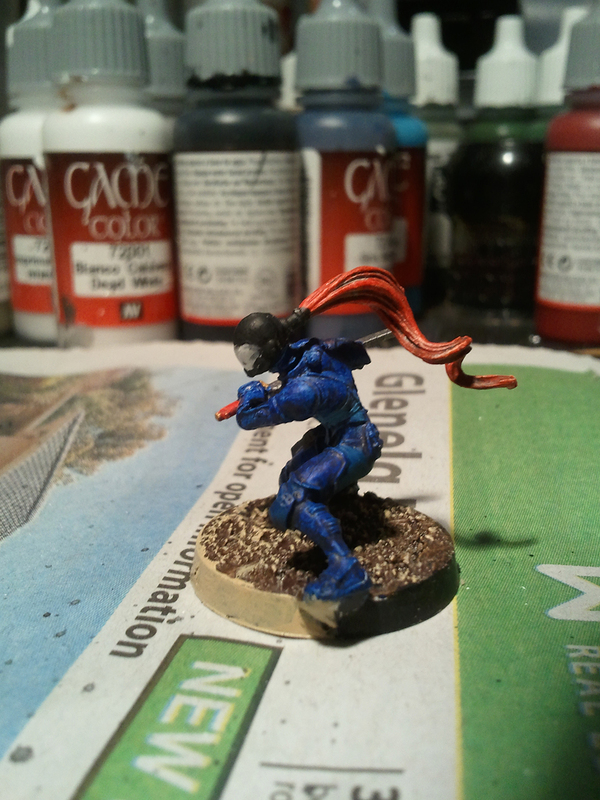 She’s pretty plain: Stormy Blue, Black for the helmet and Dead White for the face part. The pony tail is Blood Red. I ended up doing a few of the larger panels on the armour with a different blue (I forget which one, I’ve Imperial Blue in my mind, but I think I’m getting mixed up with Imperial Purple) to break it up a bit. Not particularly obvious though. A very basic looking model really. 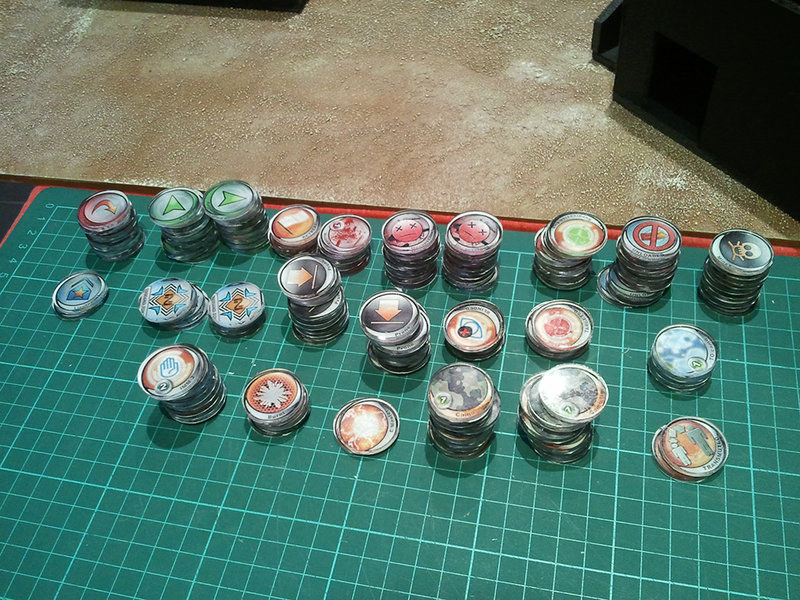 I finally got around to sorting my tokens out. If you’re just starting out with Infinity, or haven’t got any tokens of your own yet, I highly recommend not purchasing them and instead making them up yourself. It seems hard at first, but it’s really quite easy. First you’ll need to generate some tokens, check out http://inf-dice.ghostlords.com/markers/ (opens in new window/tab). You simple put in how many of what you want, then click generate. You can then save the PDF and print it out where ever (e.g. at work). Next you’ll need some 25mm acrylic discs. I grabbed them from http://www.ebay.com.au/itm/Acrylic-Disk-Circles-25mm-Diameter-3mm-Thick-x-100-pieces-Clear-/300906891649?pt=LH_DefaultDomain_15&hash=item460f72c981 (this link is the eBay store). There are also self-adhesive plastic “bubbles” that you can use, I prefer the discs though. Once you have your discs all you need is a standard glue stick. The sort kids use in primary school. Put a generous amount of glue on your printed tokens one row at a time, then position the disc over the top and press down firmly. Do them all and then leave it all to dry. Glue sticks dry pretty quick, so you shouldn’t have to wait too long. Then grab yourself a scalpel or hobby knife (make sure you’ve a fresh blade in) and cut around the discs. As you cut them out make sure they’re all stuck well. For those that aren’t, have your gluestick on hand to patch them up and make sure they’re stuck down well. I make 174 tokens and I could’ve done them in a single afternoon. That’s 174 tokens for $20 (plus a little for shipping), sure beats $20ish for 10 or so! Some of mine aren’t lined up super perfectly, but it hardly matters, they are tokens after all. Also my command tokens are circles rather than squares. Again, tokens, they’re for keeping track of things, this hardly matters. Finally I set up the above table on which my mates and I played a couple of games. The first was two of my mates against each other playing Biotechvore. It’s one of the new missions for 2015 and if you’re yet to play it heed the following advice: remember the deployment zones are only 8 inches in; burn your command tokens early and use coordinated orders; link teams make things a lot easier. The Tohaa came out on top easily, partly because of the benefit of link teams, but also because the Nomad player didn’t realise the implications of the smaller deployment zone and the size of the virus area. The second game was me using JSA against the Nomad player. We went with Highly Classified, again one of the new missions. I shan’t recount the blow by blow, but the end result was a 9:1 win for the JSA. I took a very different force to usual, fielding two Karakuri (combi rifle and Mk12), Asuka (as my Lt) and a Haramaki, plus three Keisotsu Butai (two forward observers and my light grenade launcher), Keisotsu Kohei with Yaozao servant and a Kempeitai with combi rifle and chain of command. The highlights for me were Asuka gunning through the field and taking out two alguacils and a hell cat (that deviated right in front of her) and my Mk12, which proved to be a very nasty weapon. Lessons learnt for me were not to let Haramaki get kited and to remember that using ranged weapons is not such a bad idea when you’re at burst 1 anyway. In particular I should’ve used my Contender against the Rev Moira when she first shot at him, then followed up against the coordinated order with the Blitzen against the Grenzer (who I was fairly confident was the Lt). The Blitzen deals E/M damage, so (if successful and he’d failed his BTS) it would’ve rendered the Grenzer isolated and (if he was the Lt, which he was) put the force into Loss of Lt state. The game ended amusingly though with me using three orders to lob grenades halfway across the field onto the Grenzer who’d gone for broke. All in all, it was a fun game and we learnt some things which is always good. Currently I’m working on my next two Aragotos, but they’ve been on my painting table for two or so weeks now and aren’t moving fast at all. I’ll get them done at some point though. 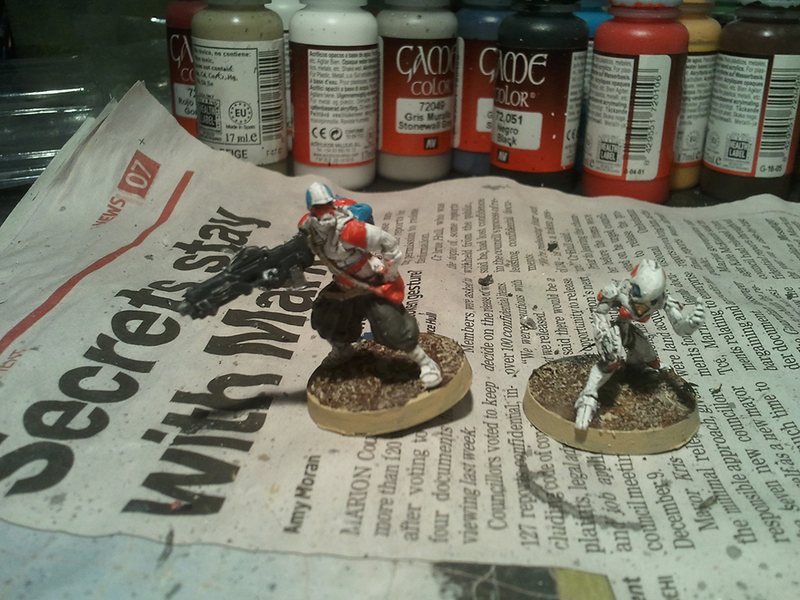 Then it’ll be onto my new blisters I think: paracommandos and Spetsnatz with boarding shotgun. That’s right, it’s a Friday update! This week I’ve painted three miniatures, made a list of all the hobby things I have pending/to do, madly put together some scatter terrain (in progress as I type) and got back to planning Bolt Action things. 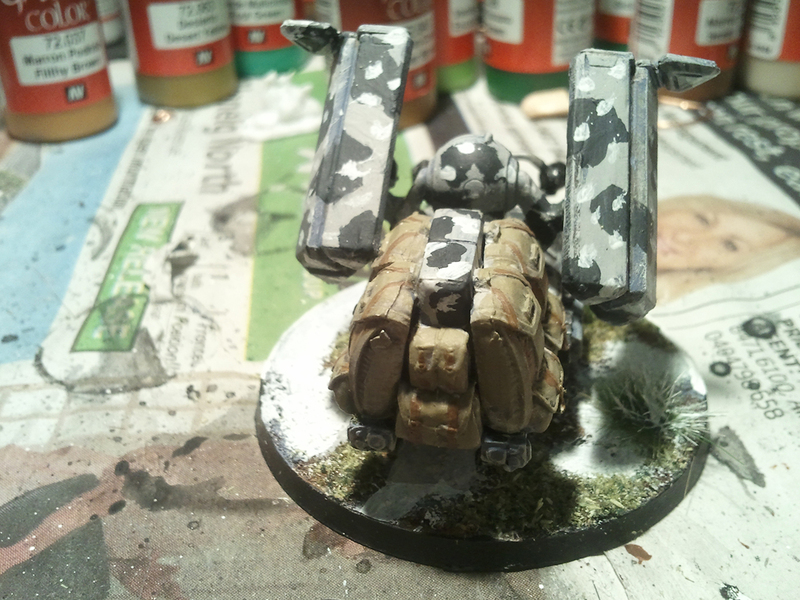 First up we have the Domaru Butai with boarding shotgun. Not much to say here really. She’s got white armour and red shoulder pads – that’s pretty stock standard JSA colouring right there. Gluing the arms on was a little fiddly, and I’m not convinced the right arm is in the correct spot on the shoulder, but it fits, it’s glued, I’m not complaining. 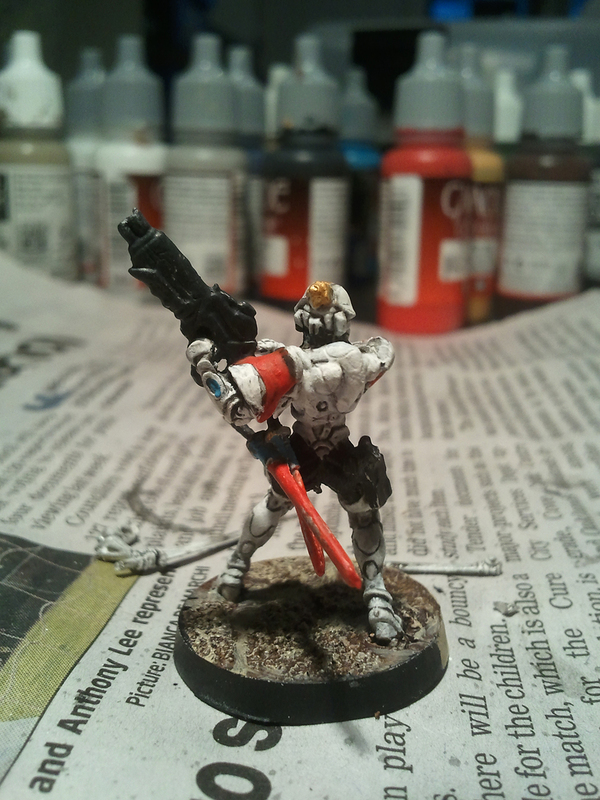 Having the choice between fielding a chain rifle Domaru and a Domaru with a boarding shotgun is a good one to have, which is what the rest of the JSA painting is all about really – models that provide choice, rather than models that provide variety (the JSA range is only so big, and I, after all, own it all). 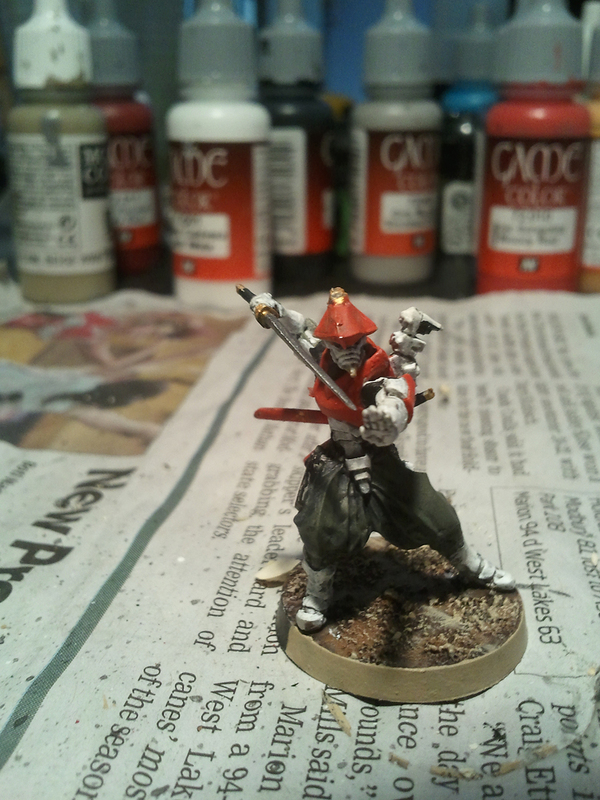 Following the same theme, we have the other Kempeitai model, again providing more kit choice. 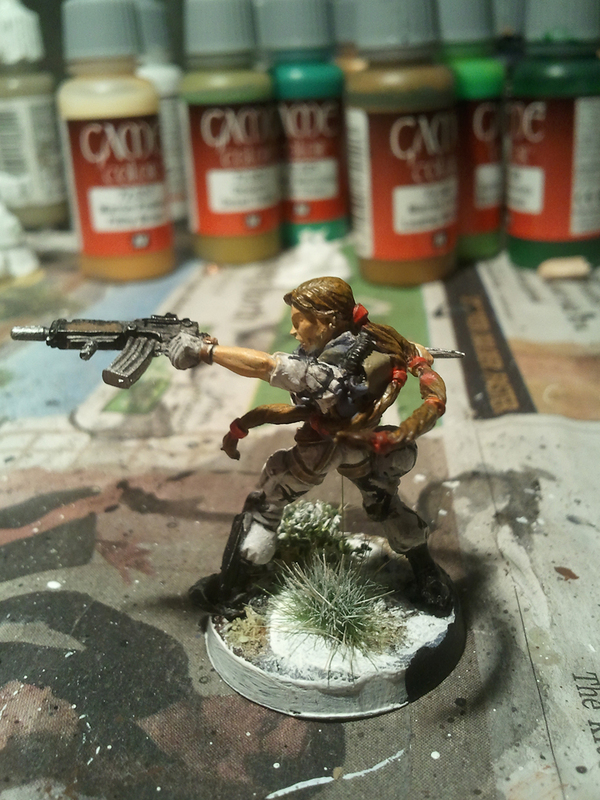 She’s done the same as my other Kempeitai: pants are German Field Grey over German Grey (I love the JSA pants, did I ever mention that? 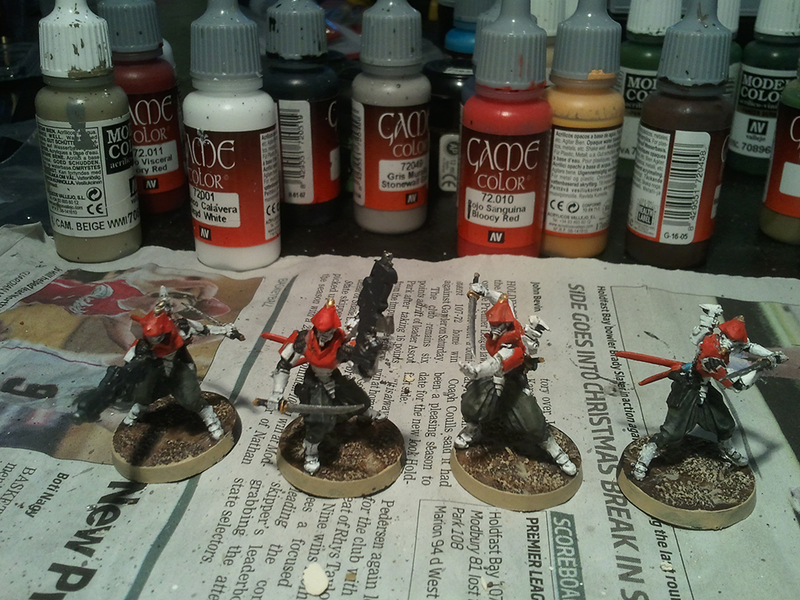 ), coat and armour is Dead White, coat trim is Stonewall Grey. 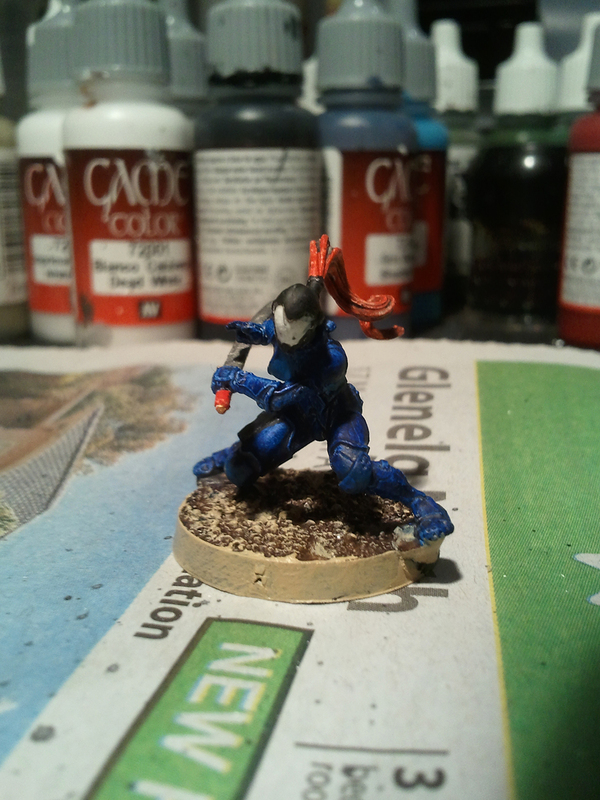 Middle chestplate area is Bloody Red (as are the shoulder pads) and on this model I decided the centre panel of the armour would be Electric Blue (on my other Kempeitai it is white). I also should mention here that I’ve changed how I do my swords and scabbards. 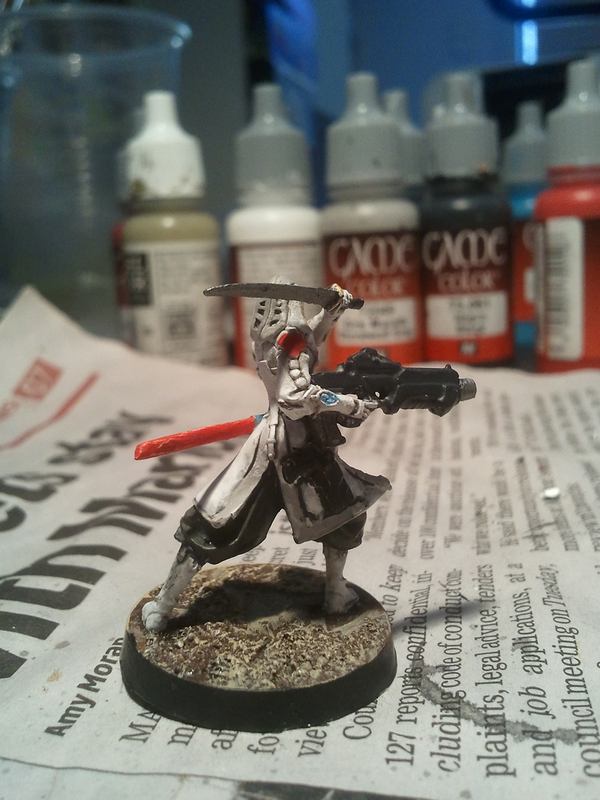 On my earlier JSA models (Domaru Butai w/ Chain Rifle, Kempeitai w/ Boarding Shotgun etc) the scabbards are black with red trim (the sashes at the top of the scabbard) and sword grips are black. 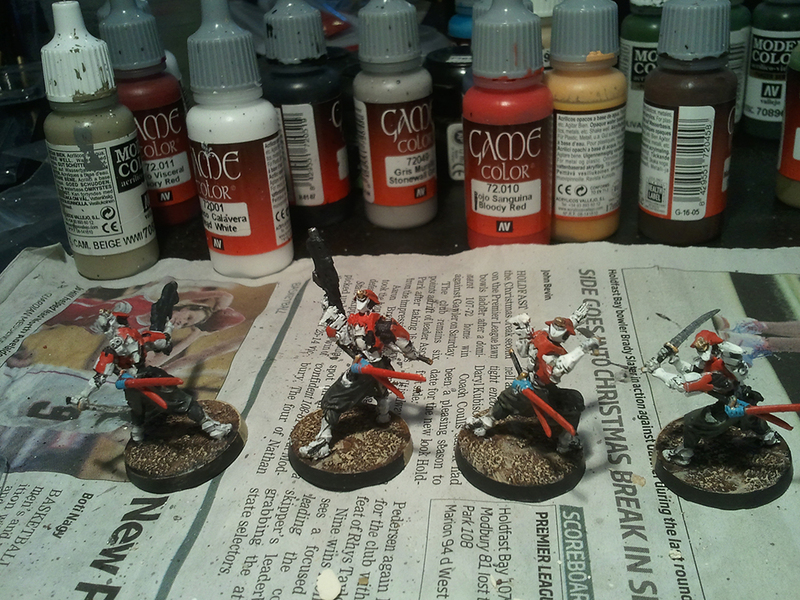 I’ve decided to add more colour and go with red blade grips, red scabbard and Electric Blue sashes. I’ve been looking forward to having this Kempeitai model done, I’ve more often than not found myself wanting to field a combi rifle on my Kempeitai, rather than the boarding shotgun (and there have been a couple of times the boarding shotgun choice has led to poor performance). Given the Kempeitai’s good, but not great, close combat abilities and the fact you really want to run them with Chain of Command and try keep them in safer firing zones, the combi rifle is the stronger choice in my opinion – hence the combi rifle costing more points to field. Finally we have the Comms Tech from the Dire Foes mission pack. 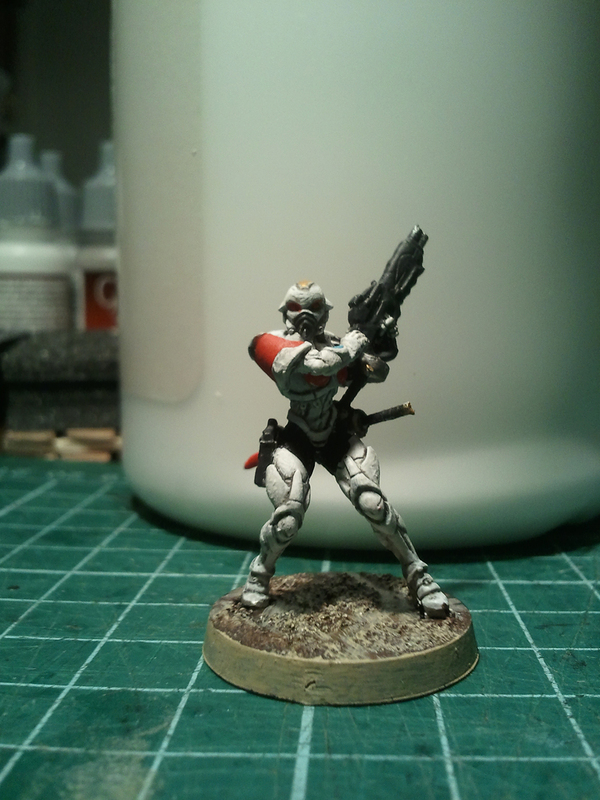 This mission pack was my first ever Infinity purchase and until this model I have been yet to paint any of it (though I’ve looked over the contents to see how it all fits together etc). The reason I’m starting with the Comms Tech is pretty simple: I need a HVT model (preferably one for each faction really). 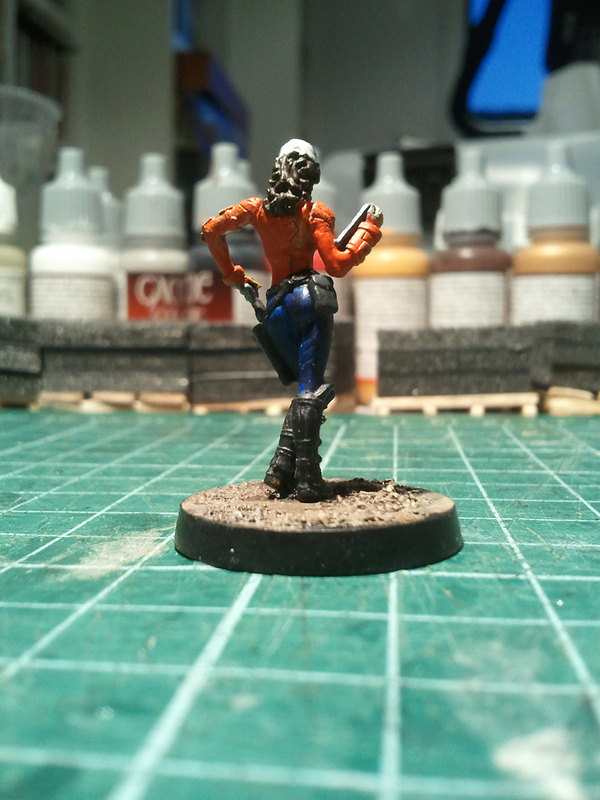 With games 3 and 4 of our ITS league on tomorrow night, I wanted her done in time for that. 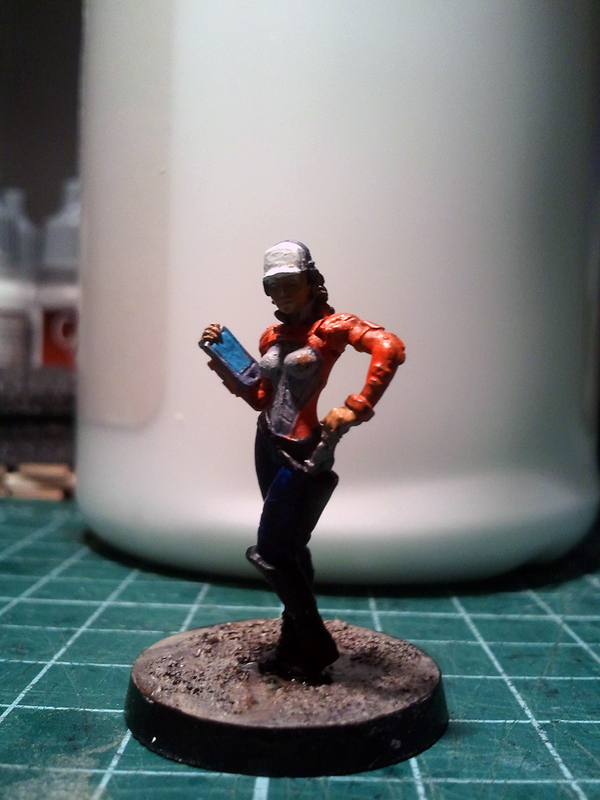 Pretty simple and straight forward here: Black boots and belts, Stormy Blue pants, Hot Orange vest (gotta have a high vis vest on site, there was no way I was going to do the vest blue like Corvus Belli have her painted up! ), Stone Wall Grey under shirt. 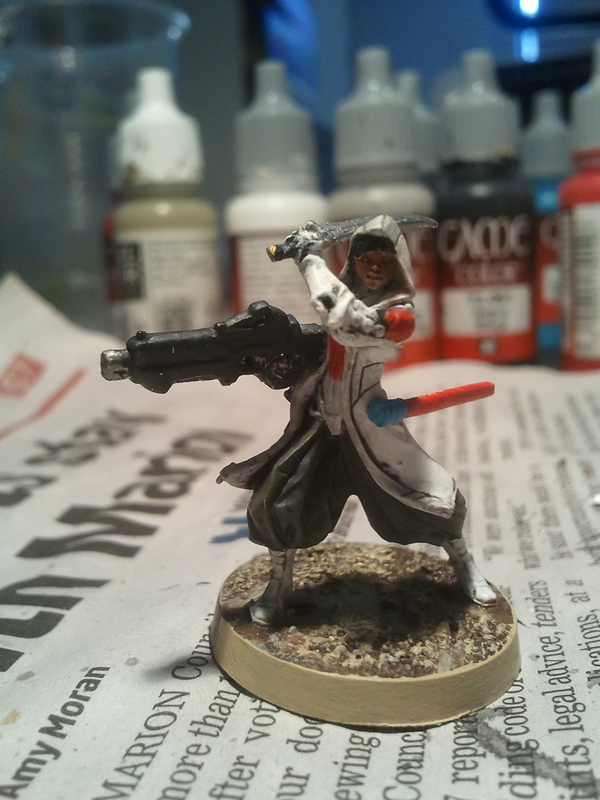 She was very quick and easy to paint and I’m pleased with the results. I mentioned some other things above and from here on out we have a wall of text on what I’m planning to do next. The first thing is to declare March “Infinity Month”. Last year I had “Flames of War – North Africa Month” in September over which I focused all my efforts in getting my DAK ready for battle (the battle part is still yet to happen, much to my disappointment). I did up a calander and planned out what I would paint each week and the whole thing was very successful. I’ve decided I’ll do the same thing this month for Infinity. 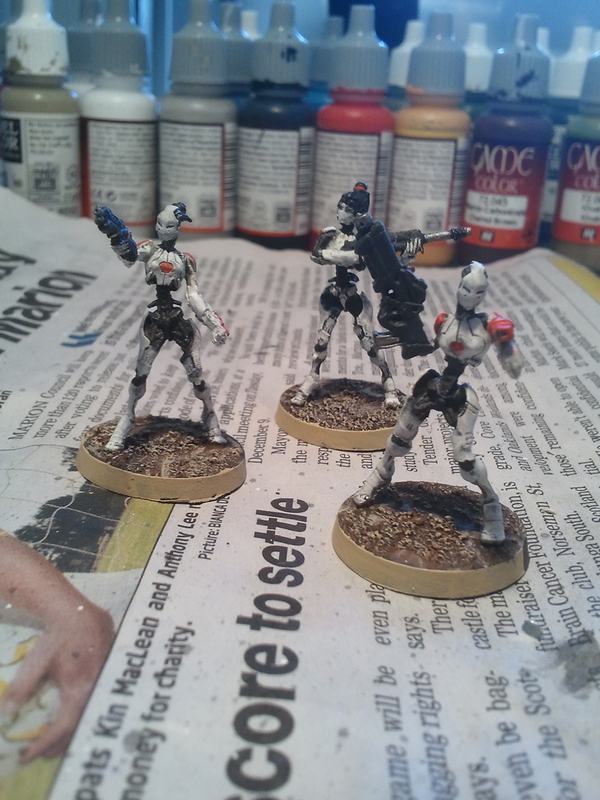 So far I’ve got the three aforementioned models done. Over the next week I want to knock off the JSA Support Pack models (and maybe the Ninja with Hacking Device), following that I’ll do the Aragoto Senkenbutai box (and maybe the Haramaki with missile launcher), In the last week of March I’ll take on the Dog Warrior box and then in the last days of the month/first week of April knock off the Tracktor MULs (and maybe the Line Kazak with Missile Launcher). Getting all this done will knock off everything I actually anticipate using on a fairly regular basis. The only other task to add in there is to rebase my other Aragotos (which I am not looking forward to, I suspect it will be difficult). It will also shrink my Infinity painting pile down to three blisters (four if I count the Authorised Bounty Hunter) and two boxes (JSA TAG and the other two Dire Foes characters). Another excellent thing to take place is that this weekend (which is a long weekend) I will finally be getting shelves up in my garage, providing much needed wargaming related storage space. With this done I can actually get terrain making projects going again – although I’ll probably not do anything until next month. 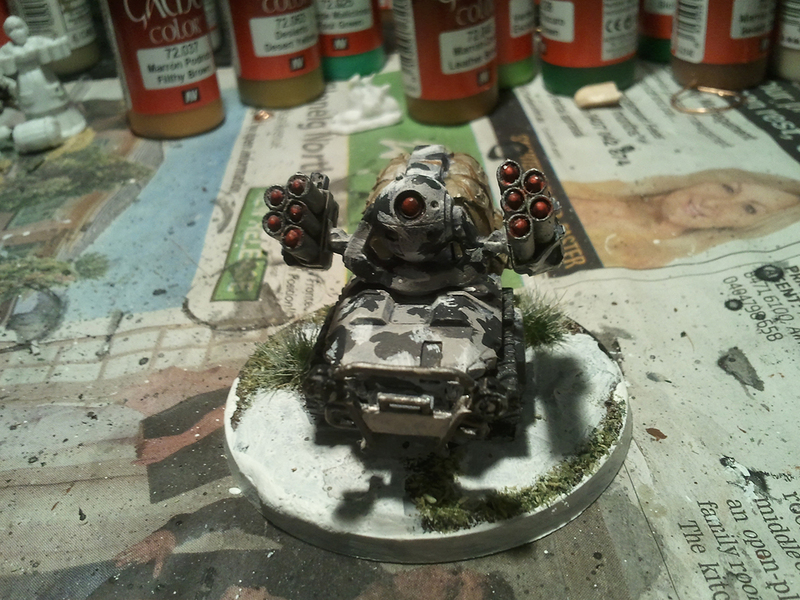 The exception to that is knocking off some scatter terrain. The reason for my rush to get some done is, again, our ITS league games tomorrow. 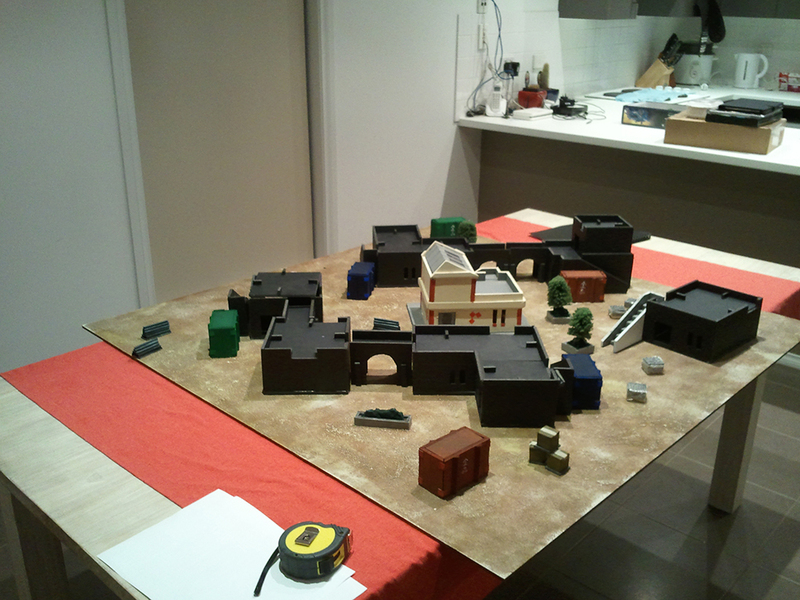 Two guys currently provide all our terrain, but extra scatter terrain has been requested if possible. I’m hoping that I will be able to get together: six pallets of bricks (I made the pallets last night, I’ll do the bricks tonight); six girder piles; four small electrical/traffic light control substation box things (the ones on corners near traffic light intersections); and maybe two large hydrant boxes (in miniature terms they’d be about 30mm deep, 30mm high and 60mm wide, or there abouts). It is all fairly simple and small stuff to put together and straight forward to paint, so I’m hopeful it will all be done in time. Finally I’ve got back to planning Bolt Action things. 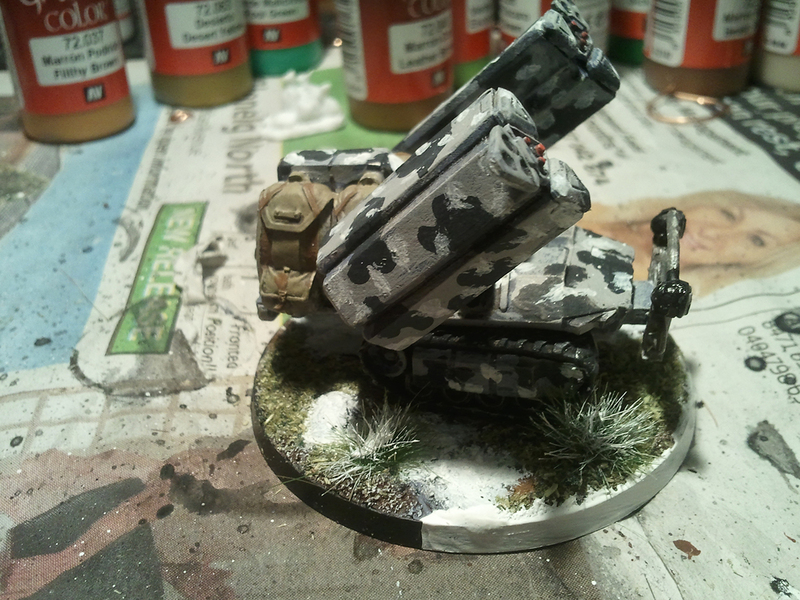 I had wanted to dedicate Quarter 2 of 2014/15 to Bolt Action, however that wasn’t to be. Projecting out to the end of Infinity March, I anticipate that I will be able to focus significant energy on Bolt Action. While there are still plenty of other projects that could be done, that fact is that I will have enough on hand for Infinity that I can host two tables at home with easy. 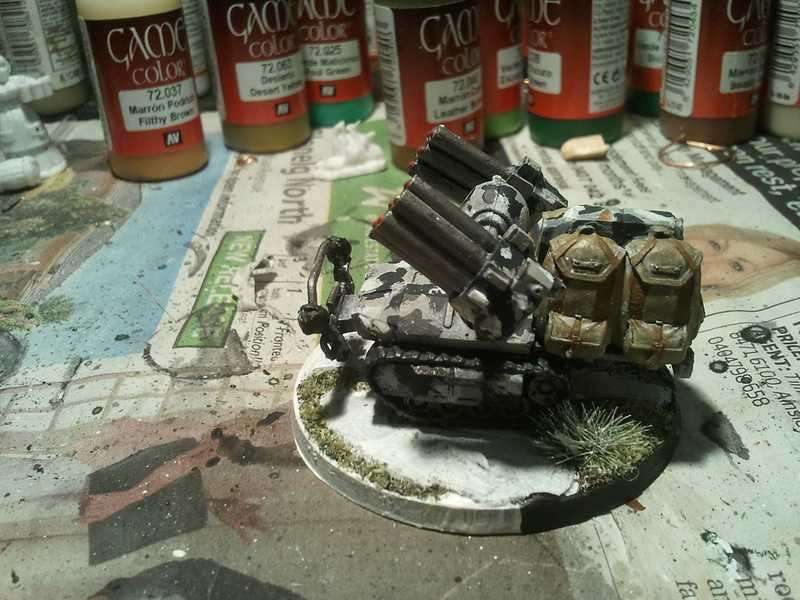 Likewise for Flames of War I’ve had my Eastern Front stuff in a useable position for years. I’d like to get my Bolt Action stuff to the same point, in fact I’d like to do quite a lot of things for Bolt Actions because it is a game that my mates (who do not actively collect and play wargames) would be in to, and it’s quite a bit less intricate than Infinity (where it pays big time to know what each and every model is capable of). 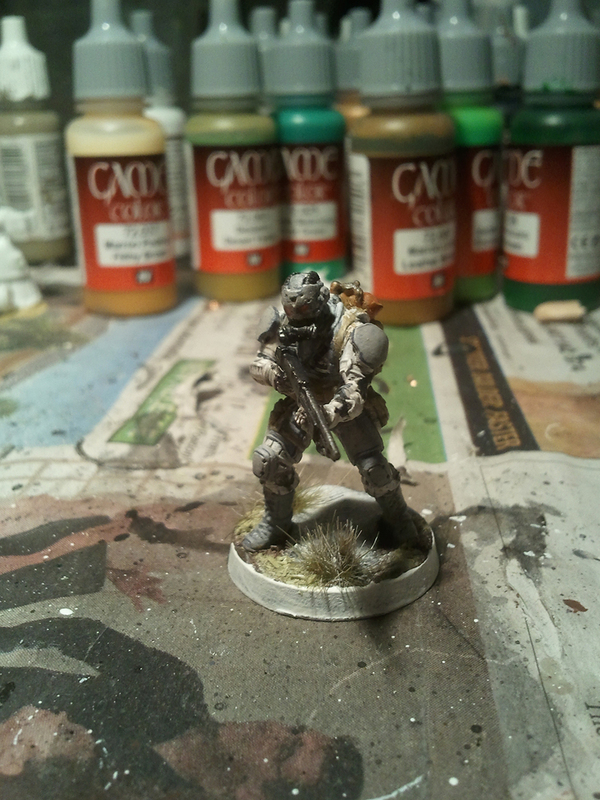 I’ll likely fit in Infinity terrain production in the mix, but I’m hopeful that once Infinity March is over, and I can ease off the Infinity pedal, I’ll finally (finally1) be able to put significant effort into Bolt Action. Only time will tell though. 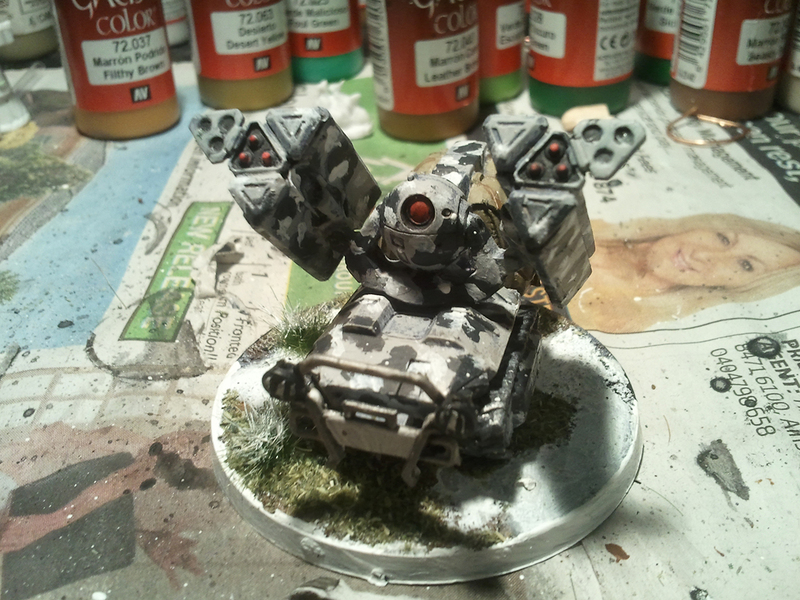 For now it is time to go back to making this scatter terrain as quickly as possible. There may be a post Sunday or Monday with the outcome of tomorrow’s ITS games, otherwise I anticipate another Friday post next week with the next results from Infinity March! 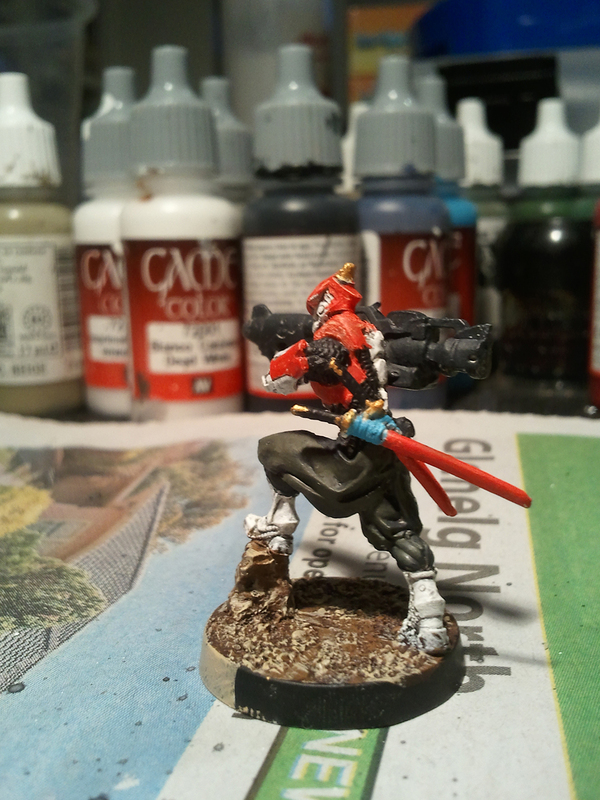 So I painted some things this week after wasting the week before doing not much. Actually that’s not quite true, for I broke a promise to myself. I had said that I would not purchase any more miniatures for Infinity until I was done/mostly done the pile of stuff I have on my painting table at the moment. Aaaand then I went and bought the Dog Warriors box, the Cameronian blister and ordered the Spetsnatz with boarding shotgun (which didn’t arrive for some strange reason, even though it was in stock). 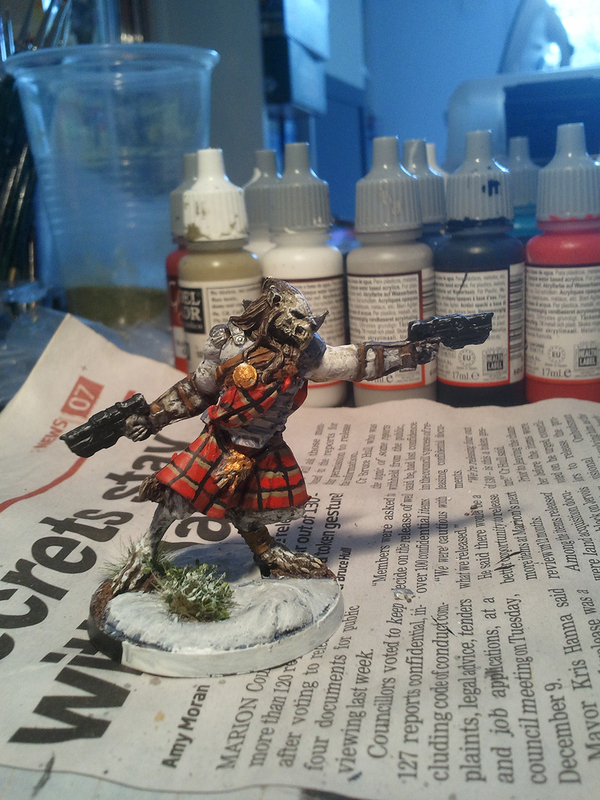 This has led me to breaking a second promise, which was to never paint tartan again after the Grey Rifles model in the Ariadna starter. I think I did a better job of it this time, but it is still far from fantastic. Here is a shot of the three Karakuri models. The image hasn’t got the front right hand model in focus unfortunately. They’re ok, I couldn’t get the eyes right on the Mk12 model (rear most model) as you can see in my post from when I finished that particular miniature. They’re ok though and I look forward to using them. 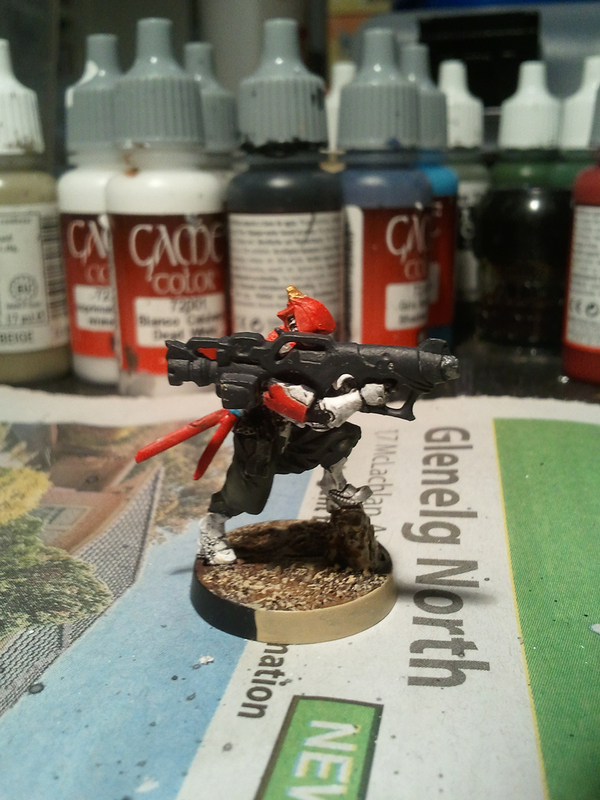 Very basic: white, black piping, red swatches and chain rifles. 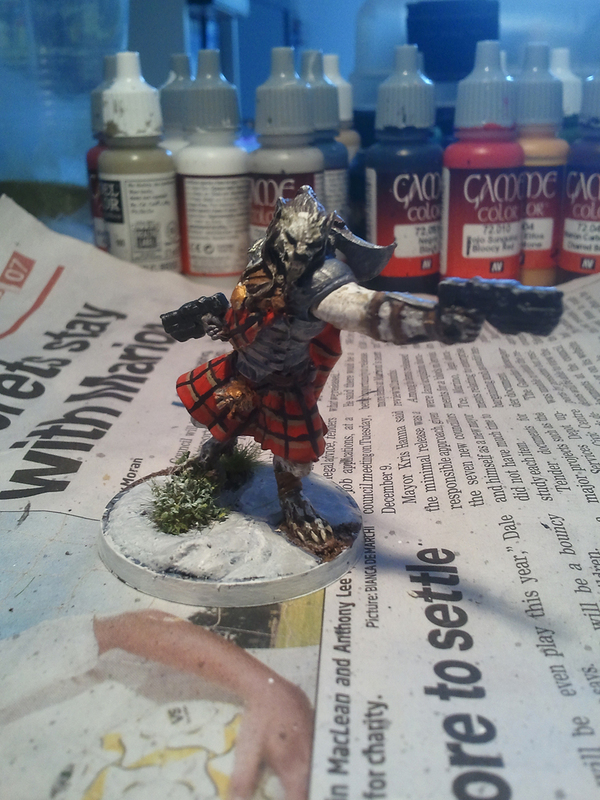 Here we have my second go at doing tartan. I think it came out much better this time round. In fact I really like how the model came out as a whole. The middle shot there sells him best I think. 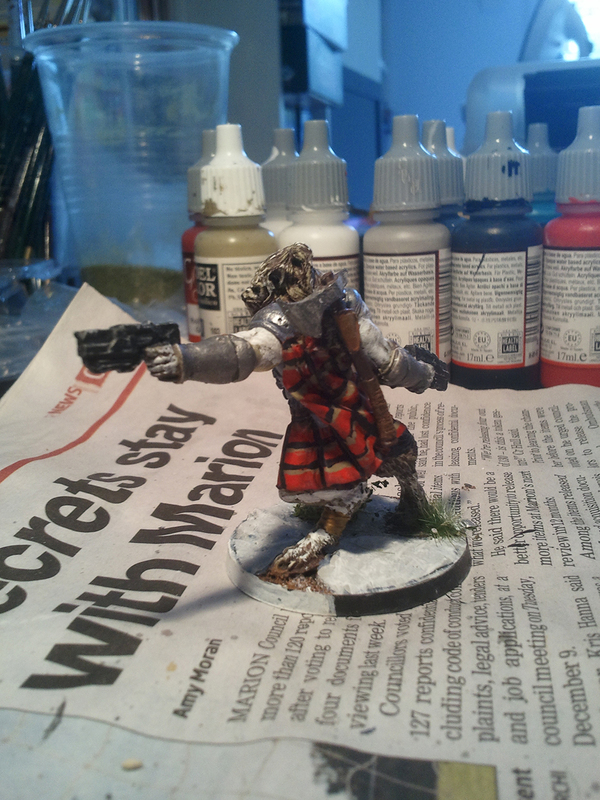 Up close the tartan is pretty lacklustre, but at table distance it looks nice. 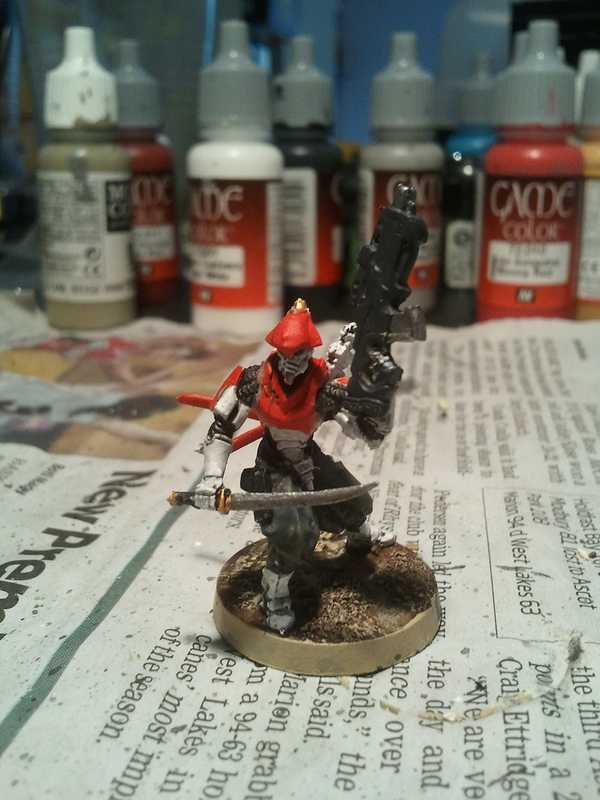 It was a base of Gory Red over which I did a coat of Bloody Red. Then horizontal stripes of German Camo Beige and Black and vertical stripes of Black. 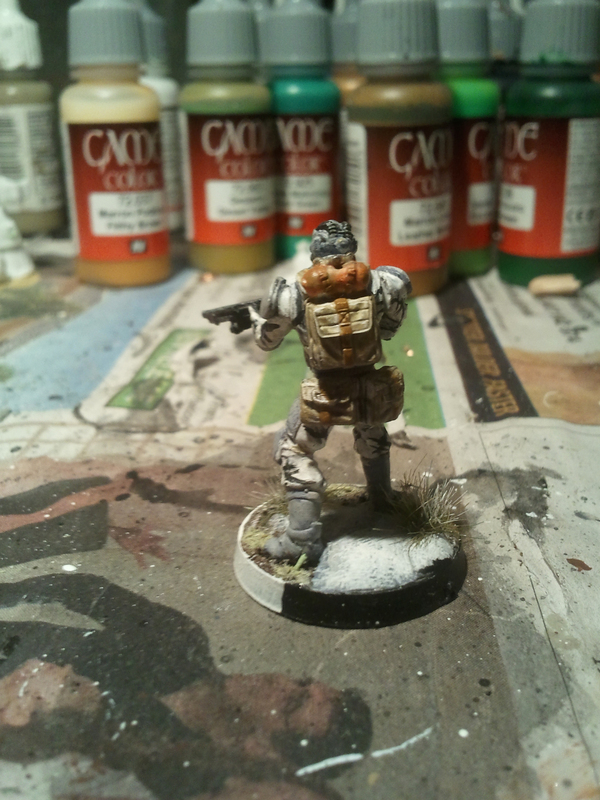 Body armour is Stonewall Grey over Shadow Grey, flesh is Dead White built up from Charred Brown to German Camo Beige. 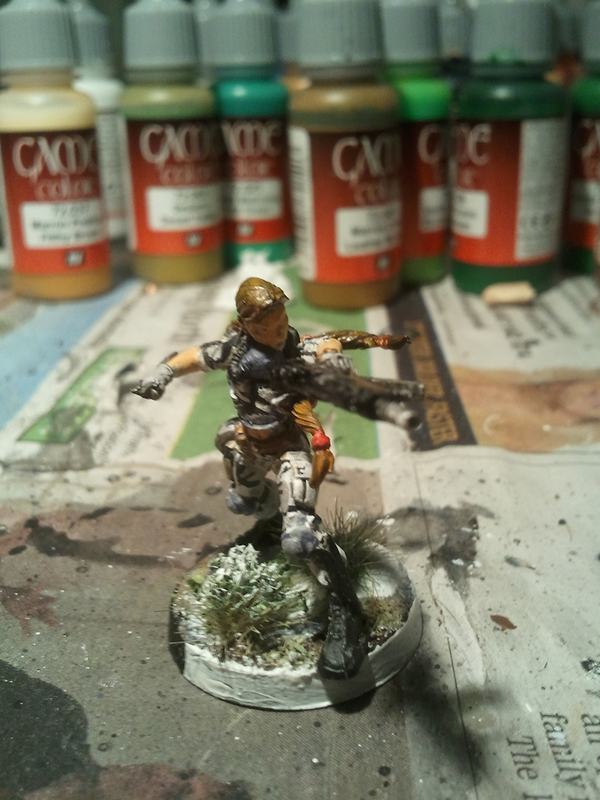 I kept the hair and tail darker with a light dry brush of German Camo Beige. All in all, he’s pretty cool I think. 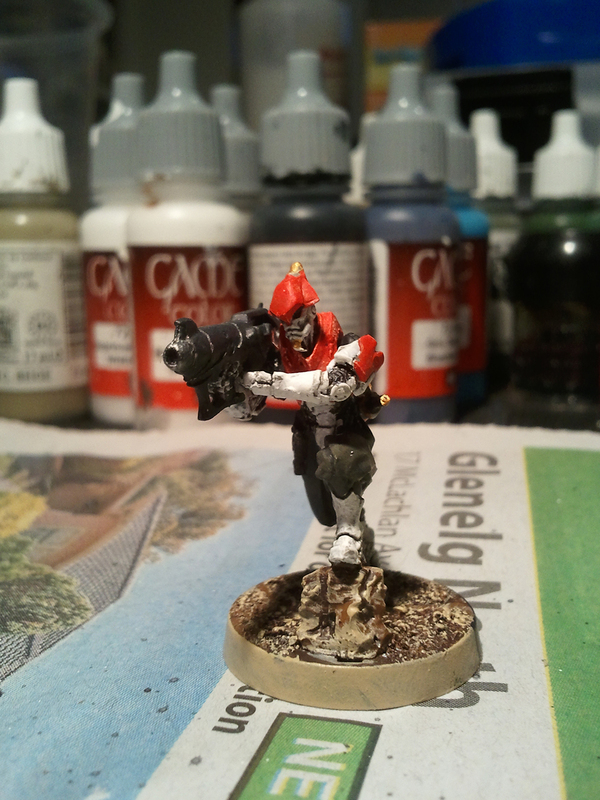 Next up: Domaru Butai w/ Boarding Shotgun, Kempeitai w/ Combi-Rifle and the Comms Tech civvie from the JSA-Aridana dire does box (which I want done for next weekend’s ITS games).